Former WPP boss Sir Martin Sorrell has repaid the company £170k of personal expenses for items such as ski trips, travel for his wife and child, and objects for his home in New York, according to a report in The Wall Street Journal. Sorrell stepped down last April amid claims of possible misuse of company assets and 'personal misconduct'. At the time, he 'strenuously' denied all claims, and this week his spokesman affirmed that 'All Sir Martin's expenses were regularly scrutinised and approved by WPP management, the audit committee and the Board, and were audited annually'. However, WPP has confirmed it has received the £170k, and says it is in an ongoing dialogue regarding further sums owed. 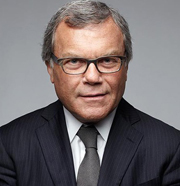 Sorrell (pictured) led WPP for more than 30 years, during which time he acquired ad-related companies (including J Walter Thompson and Ogilvy and Mather), and set up a data investment management (DIM) division, whose portfolio of agencies includes Kantar TNS, Kantar Millward Brown and Lightspeed. In 2017, Sorrell became the highest paid exec in the UK's FTSE 100 companies, with a salary of just under £41.6m. Since his departure, Sorrell has set up a publicly listed company called S4 Capital, which last summer beat WPP in a race to buy Dutch creative digital production company MediaMonks, and has recently merged with programmatic solutions provider MightyHive. Web site: www.wpp.com and www.s4capital.com .